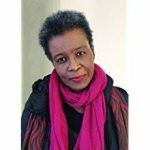 Claudia Rankine (born 1963) is a poet, essayist, playwright and the editor of several anthologies. She is the author of five volumes of poetry, two plays and various essays. Rankine is a Chancellor of the Academy of American Poets and the Aerol Arnold Chair of English at the University of Southern California. Her most recent work, the book-length poem, Citizen: An American Lyric, won the 2014 Los Angeles Times Book Award, the 2015 National Book Critics Circle Award in Poetry (the first book in the award's history to be nominated in both poetry and criticism), the 2015 Forward Prize for Best Collection, the 2015 Hurston/Wright Legacy Award in Poetry, the 2015 NAACP Image Award in poetry, the 2015 PEN Open Book Award, the 2015 PEN American Center USA Literary Award, the 2015 PEN Oakland-Josephine Miles Literary Award and the 2015 VIDA Literary Award. Citizen was also a finalist for the 2014 National Book Award and is a finalist for the 2016 T.S. Eliot Prize. Citizen holds the distinction of being the only poetry book to be a New York Times bestseller in the nonfiction category. Her numerous awards and honors include the 2014 Morton Dauwen Zabel Award from the American Academy of Arts and Letters, the 2014 Jackson Poetry Prize, as well as a 2014 Lannan Foundation Literary Award. In 2005, Rankine was awarded the Academy Fellowship for distinguished poetic achievement by the Academy of American Poets. Rankine's work often blends genres and explores the subject matter of race and the imagination.